Edwin Yorke Macgregor was born on the 7th June 1873 in Annfield House, Kirn, Dunoon, Argyle, Scotland. He was the fourth son of John Macgregor (the second son of John Macgregor of Finnart and Margaret Fleming) and Sarah Jane Hicks. The family lived at Annfield House, Kirn, Dunoon, Argyle. John Macgregor was a shipbuilder, but retired at some time between 1870 and 1873. This was probably when Tod and Macgregor's was sold in late 1872. Sarah Jane died on the 18th September 1880 at the family home in Dunoon and in 1881 Edwin was living at 4 Jews Walk, Upper Sydenham, Lewisham, with his father, his four youngest siblings and four servants. He and his brother James probably emigrated to Canada in 1890, when his sisters Amy and Ethel emigrated. In 1901 he was in Ontario working as a Clerk. He was renting a room in the 116th division of Toronto, Ward No. 3 a-8 Page 5. The census information claims that he arrived in Canada in 1882; this seems unlikely as he would have arrived without his siblings and at only 9 years old. On the 27th of May 1916 he signed up to fight in World War 1. He gave his address as 407 Dorchester Street West, Montreal, where he was living with his brother James. He was a "Structural Foreman" and may had lived in Toronto, as his Attestation Papers state that he served in the Toronto Grenadiers. These papers also state that he was 5' 6¾" with dark hair, blue eyes and a dark complexion. He also had a tattoos; an eagle on his left arm and a mermaid and others on the right. He was not married and worked for John Quinlan Contractors, Westman, earning $5 per day. He joined the No1 Overseas Construction Battalion as a private. He embarked on the SS Northland at Halifax, Nova Scotia on 13/9/1916, arriving at Liverpool ten days later. He was then appointed an acting Corporal (this was confirmed on 13.7.1917). He landed in France on 26th of October. He was wounded on 14th January 1917 with Scabies and again in September. This latter injury was more serious, he got shrapnel in his right thigh in Belgium on the 8th of September. Having been treated in a field hospital he was transferred to Boulogne and then to Brighton on the 12th of October. "Aged 45 and looks older, general condition fair. Hit by shrapnel in right thigh last September. Two large scars from which pieces were removed. Right leg flabby and weak. Walks with a limp and unable to march." On the 12th of March 1918 he embarked from Liverpool for Canada He returned to active service on 1st of May and joined the 4th Battalion Canadian Garrison Regiment. On the 22nd of June he is reported as deserting. On the 31st of May 1920 he reported voluntarily and was discharged on the 1st of June. He had been awarded the British War and Victory medals. He gave his address as Oil Fields Ltd, 43 Victoria Street, Toronto although 175 Wheeler Avenue is later mentioned. After the war he married Hilda Clarice Bolton. She was the daughter of Joshua and Ellen Bolton, born on 30th June 1890. Joshua was a caretaker earning $750 p.a. in 1901, he was born in England on 8th March 1856. Ellen, also born in England, was born on 26th January 1960. Hilda had a sister Ethel Maud, born in 1888 and a brother, Norman Clifford, born in 1892. 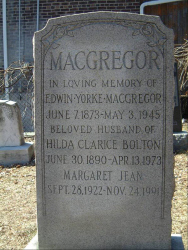 Shirley Eleanor Macgregor, born Feb 1st 1926, married Victor Lee Wikstrom (born 1928), lived in Peterborough, Ontario, adopted a son Shawne. 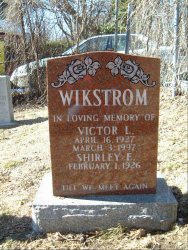 Victor died in March 3rd 1997. Shirley died 2004. Edwin & Hilda lived at 40 Hambly Avenue, Toronto. Hilda was a member of the St Aidan's Anglican Church for 60 years and also a member of the Women's Auxiliary.